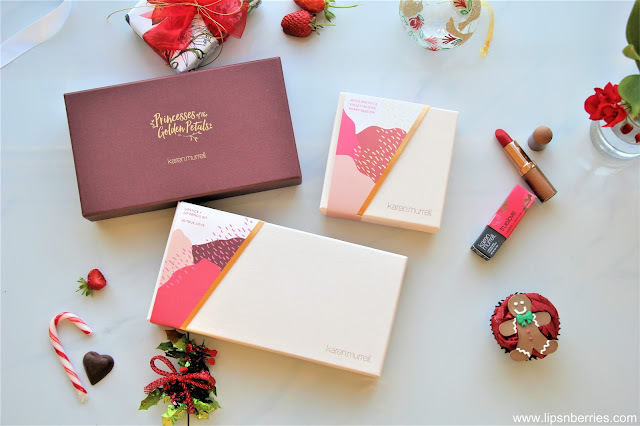 2/5 Christmas Gift Guide- Best Natural Lipstick Gift Sets by Karen Murrell | LIPS n BERRIES! I have an undying love for lipsticks. 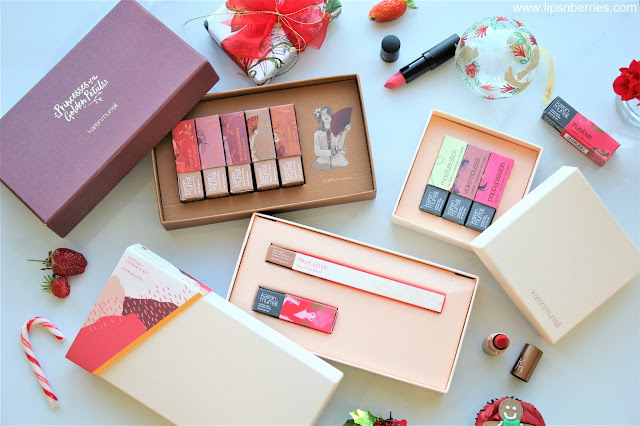 So lipstick sets are probably the best gift for someone like me who adores makeup but also loves naturally derived products. What better lipsticks than New Zealand's top export to the world, Karen Murrell. I've mentioned them a lot of times on the blog. You just have to put them on once and you'll know why! The delicious scent and even better ingredients, these natural lipsticks are going to please your lovely ladies for sure. Who doesn't like the sound of avocado & evening primrose oil, cinnamon & sweet orange. Its a dream combo. No wonder they got a mention in my last year's gift guide too. Don't worry I'm talking different sets this time :) I like to keep some variety. Karen Murrell's lipstick quality is ace. They are very moisturizing. You can almost do them without a lip balm. The darker shades have near opaque coverage. The lighter shades need a couple of coats. 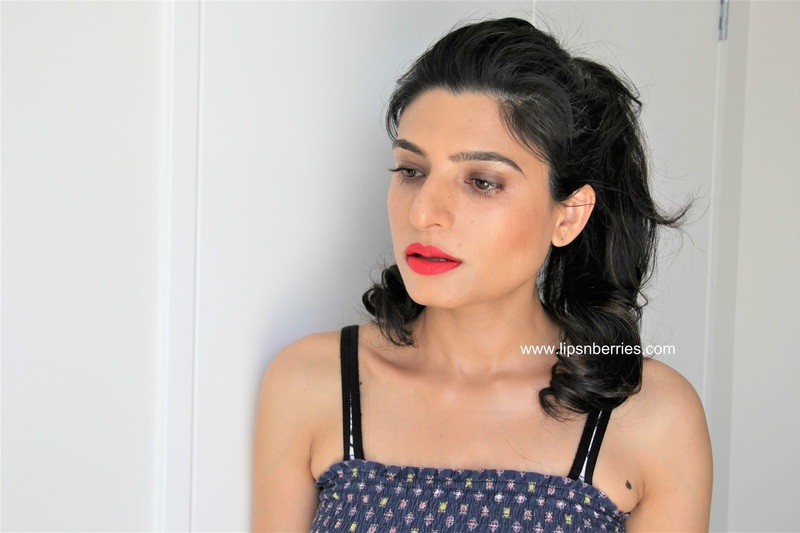 Do note that these lipsticks do not have any synthetic dyes or colors. They are completely naturally derived. They don't have the insect derived ingredient Carmine (which is in most lipsticks) so they are completely Vegan & Cruelty Free too. 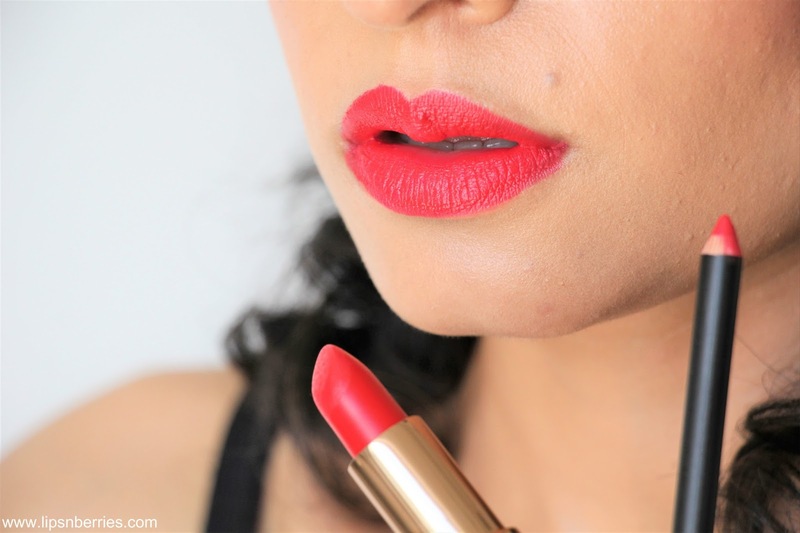 Because of absence of these key lipstick ingredients they are a little different from your usual Revlon's and MAC's in terms of coverage, but once you get used to their feel & taste, there's no looking back. The cinnamon in them plumps up the lips a little too. They even last long, surviving food and all. Specially if you have a matching lip liner underneath. 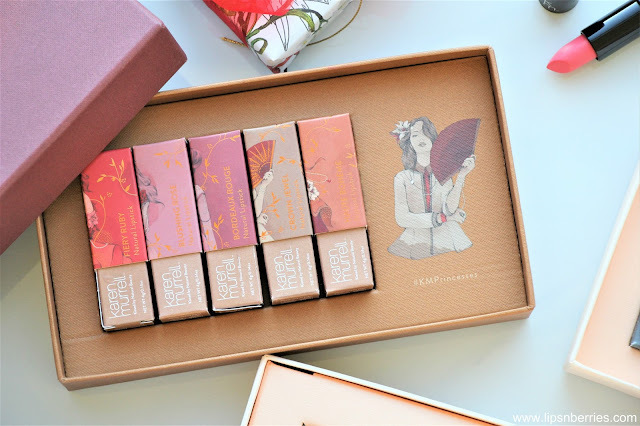 For my second gift guide (2/5), here's my top 3 lipstick gift sets from Karen Murrell. 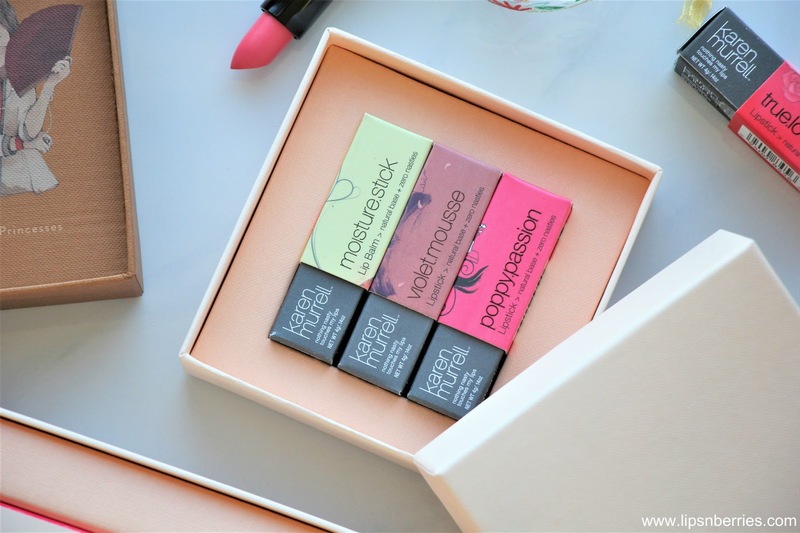 This gorgeous 3 lipstick set has their Moisture Stick Lip Balm, one of their bestsellers 'Violet Mousse' lipstick and the very fun 'Poppy Passion' lipstick. It's such a perfect gift set that ticks a lot of boxes. Can we admire the gorgeous neat box too? The lip balm stick has gone straight to my makeup bag & I can confirm that its very hydrating and not very wet either. Perfect for layering under lipsticks. Karen Murrell has 2 more color combos in the 3 piece set, just in case you're not feeling these shades. If your lovely lady is a fan of red lips, this is the set for her. It comes with a matching lip liner that I'm seriously impressed with as it has a lip brush on the other end. The red color is the most gorgeous red, very different to all the other reds in my collection. It's a cool red with certain neon-ish brightness to it. Definitely lifts up the whole face and mood. True Love is truly one of my favorite lipsticks from them. The matching pencil lip liner glides on like a dream. A red lip liner is such a essential and I'm so glad it comes with a brush so I never have to look for that tiny lip brush in my makeup stash. Very handy! This collection came a few months ago and it is beyond stunning. Karen Murrell released a collection of 5 gorgeous lipsticks - Fiery Ruby, Blushing Rose, Bordeux Rouge, Crown Jewel and Haute Boheme. The collection covers the whole color spectrum from a beautiful warm brick red to neutral pink to a wearable burgundy to Gold and copper metallic lipsticks. It is a class apart in every way! 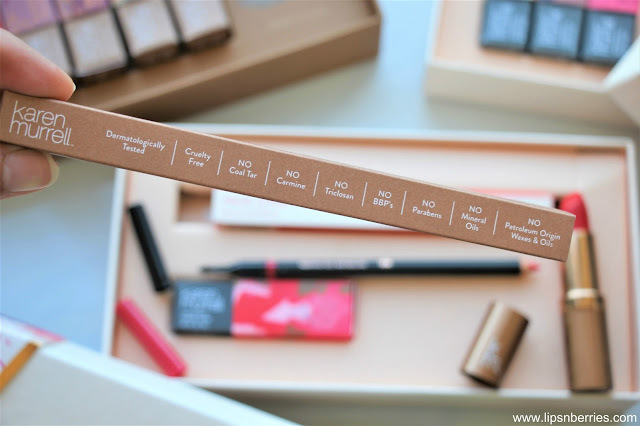 I have reviewed the whole collection on my blog and even did a look book with each of the shades. This post is probably the highlight of my 2017 blogging year. One of the few that I'm proud of. Though these 5 lipsticks are not available as a whole, you can purchase them separately from KM website or pharmacies & health food stores NZ wide ($32 NZD each). Each of them is a beauty. I'd highly recommend you to check them out. Would you like to receive these lipsticks as Christmas gift? Which one out of these 3 sets do you fancy? 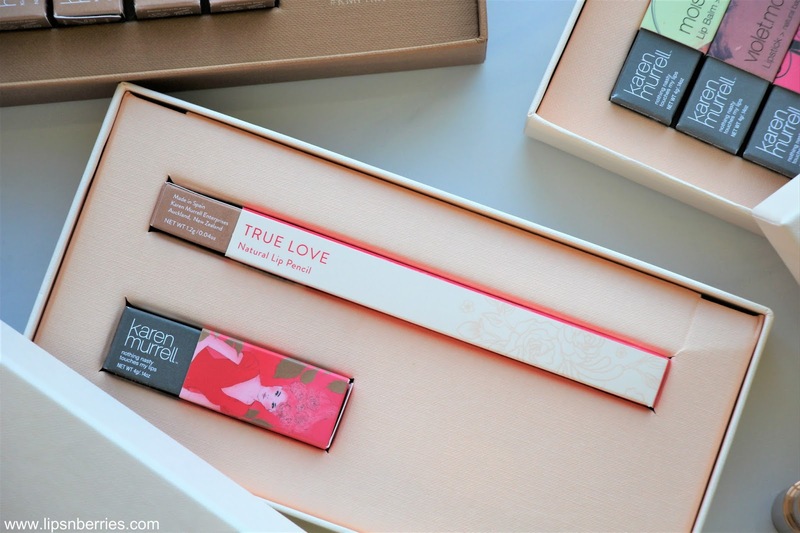 I'm all for that True Love lipstick + lip liner set. Its so useful and beautiful!